Facebook is planning to expand a project that it launched last year in Taiwan to help local businesses carve out a bigger space in the global market and cultivate digi-tech talent, one of its executives said Thursday in Taipei. Under its Made by Taiwan program, Facebook will pour more resources into Taiwan in a bid to make the county’s industries more digitally competitive, said Facebook Vice President Dan Neary. Facebook recognizes the importance of the Taiwanese market in the region and the opportunities it presents, he said, adding that his company will work with Taiwan to promote local brands and help domestic businesses connect with global customers. Currently, under the “Made by Taiwan” project, Facebook provides marketing courses about how to effectively use Facebook to build business for the international market. Starting next year, Facebook said, it will expand the project by launching nine programs to advance the development of the domestic economy, technology and talent in Taiwan. Through such programs, Facebook said, it is aiming to take 1,500 Taiwan business leaders to Silicon Valley to engage in exchanges with entrepreneurs there, help 15,000 Taiwanese small and medium-sized enterprises tap into global markets, and nurture 50,000 professionals with digital and technology skills by 2020. The social media giant has more than 2.2 billion users worldwide, including about 19 million in Taiwan, according to Neary. Facebook’s commitment to expanding its operations in Taiwan is in line with the company’s core mission of providing connectivity for communities, he told the 500 participants who were mostly from the business community. 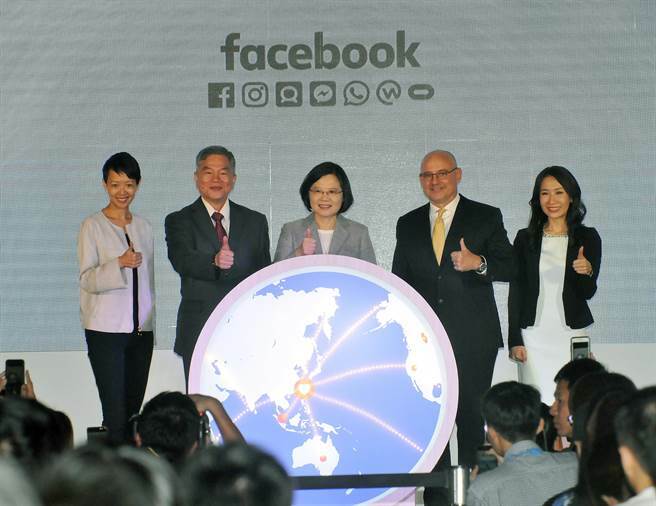 President Tsai Ing-wen (蔡英文), who also attended the event, said in her address that “Taiwan is the best friend of Facebook,” as evidenced by its Facebook penetration rate, which is higher than anywhere else in the world. Tsai said her administration’s “5 plus 2” industrial innovation development program will serve as a foundation for working with Facebook on its “connectivity mission” and for building Taiwan as hub that will connect to Silicon Valley and the rest of the world. Taiwan already has the relevant infrastructure, comprehensive industrial clusters, a highly advanced information technology society and a deep talent pool, and is committed to expanding renewable energy, which makes it the “the best business partner for Facebook,” Tsai said.